Our group of 16 members were met by our Susannah Place guides and were seated for a 10 minute DVD presentation about the Rocks area, known as Tallawoladah by the Cadigal people. The Rocks area was established shortly after the arrival of the First Fleet in 1788, set aside for the convicts to pitch their tents. The original buildings were wattle and daub with thatched roofs. Later more substantial homes were built of local sandstone. In 1900, bubonic plague broke out and the state government resumed areas around The Rocks and Darling Harbour. Hundreds of buildings were knocked down in an effort to eradicate the rat plague, but the onset of World War One halted the demolition program. During the 1920s, several hundred buildings were demolished for the construction of the Sydney Harbour Bridge. When the Sydney Cove Redevelopment Authority took control of the area in 1968, its intention was to demolish all remaining buildings, re-developing them as high-density residential dwellings. In February 1971, a group of local residents formed the Rocks Residents Group to oppose the plans, appealing to the Builder's Labourers Federation which imposed a green ban. Instead of demolishing The Rocks, streets were realigned, old buildings renovated, and new tenements constructed for waterfront workers. The Rocks was transformed into a commercial and tourist precinct. Our group was divided into two and our guides led us through two of the four houses now known as Susannah Place. The original owners were Edward and Mary Riley. They lived in No 62 and rented the other three out. In 1853 when Edward died, Mary became the owner and continued living in No 62 until her death in 1874, an owner and resident for nearly 30 years. In her will Mary left houses 62 and 64 to her granddaughter Mary Ann Finnigan and the other two houses 58 and 60 to the Church of England. Mary Ann and husband John ran the grocer’s shop at No 64 briefly but by 1886 they had moved to Granville. A series of more than 100 families lived at Susannah Place over the period 1844 to 1990. 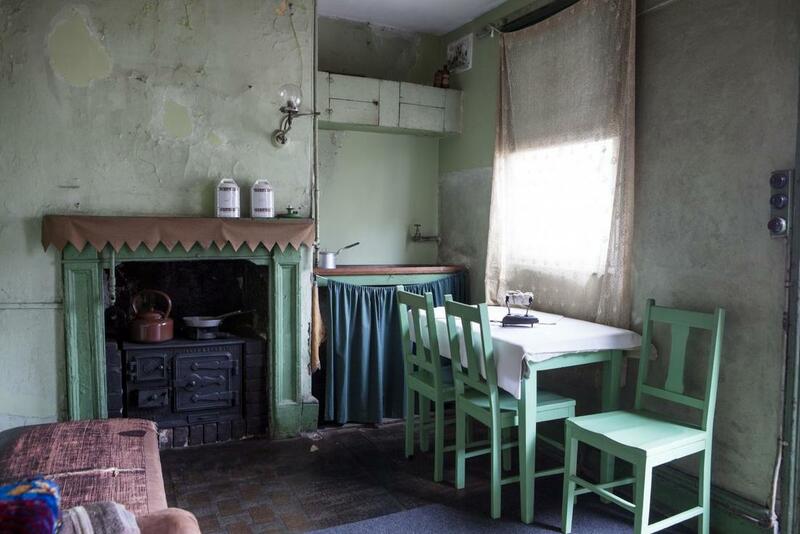 At No 58 our guides pointed to evidence of home improvement: Marks on walls, remnants of paint in government-issue maritime brown, later over-painted with bright green and yellow; linoleum and wallpapers gave a glimpse into their lives. Layers of linoleum flooring dating from the 1930s reveal not only the decorating tastes of former tenants, but also the arrangements of their tables and chairs, ice chests and, later, a fridge, which all left deep marks in the floor. In the corner, food splatters mark the countless meals cooked on the gas stove that once stood next to the old fuel stove. Tenants often added their own decorative and practical touches, building kitchen shelves and cupboards, and peppering the walls with an assortment of nails and hooks. Theirs was a tight-knit working class community; families were related through marriage, children went to school together, men worked together on the wharves. 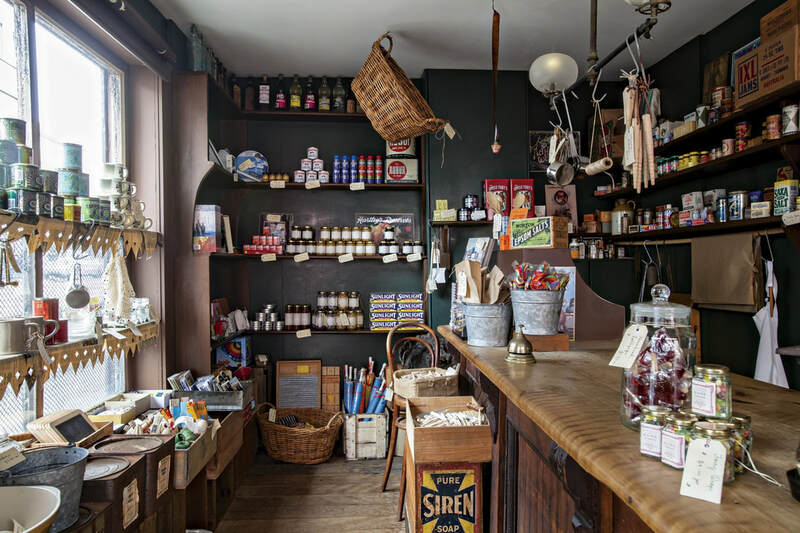 From 1845 to 1935 a grocer shop operated from the front room of No 64 supplying household groceries to the local neighbourhood. At 64 Gloucester Street two large street-facing windows and an angled corner doorway point to the building’s original design and function as a shop. Although the shop’s furnishings were stripped out after it closed in 1935, the walls retain clues about its original fit-out. Paint scrapes reveal the room’s changing colour scheme, from the original blue distemper (a water-based paint) through to the light green and white combination painted in the 1970s. Shelving ran across two walls of the shop, the shelves on one wall were installed crooked. This was a very informative tour of “living in the Old World”, the poignant stories sparking members’ memories of their own young lives compared to today’s world. After farewelling our guides we then moved onto The Big Dig.